Ghana on Wednesday commended the Federal Republic of Germany for the historic reunification and pulling down of the dreaded Berlin Wall, which paved the way for the normalization of relationship between West and East Germany 17 years ago. "Ghana shares in the joy of Germany for the achievement, which hitherto was never thought of. We are particularly gratified by the speed and consistency in the process for reunification," Nana Akomea, Minister for Manpower, Youth and Employment, said in response to a toast at the 17th anniversary celebration of German reunification in Accra. Nana Akomea, who headed a Government delegation to participate in the anniversary, which also attracted the German community in Ghana, the diplomatic corps, journalists and other West African nationals, called for greater cooperation between the two nations.German reunification took place on October 3, 1990, when the former German Democratic Republic (East Germany) was incorporated into the Federal Republic of Germany (West Germany).The start of the reunification process is commonly referred to as Die Wende (The Turning/The Change). After East Germany's first free elections on March 18, 1990, negotiations between the two countries culminated in a Unification Treaty, whilst negotiations between them and the four occupying powers produced the so-called "Two Plus Four Treaty" granting full sovereignty to a unified German state, whose two halves had previously been bound by a number of limitations stemming from its post-World War II status as an occupied nation.Dr Marius Haas, German Ambassador, recounted the 50th anniversary of Ghanaian-German political relations as well as development cooperation.He said since 1957 the commitments made by Germany to Ghana exceeded one billion Euros. "Just a few weeks ago a German delegation was here for negotiations on our bilateral development cooperation for the next two years. "Fifty-three million Euros, equivalent to approximately 69 million GHC, have been earmarked for direct budget support as well as for programmes in the fields of agriculture, private sector development, decentralization and law reform." He said there was no other African country where the exchange of high and highest ranking political visits had been as intensive as in the case of Ghana in 2007.He recounted the visit of the German President Horst K=F6hler in January for an official visit and to participate in the Second Africa Forum.Dr Haas said President John Agyekum Kufuor had already agreed to attend the Third Africa Forum to be held in Germany early next month. 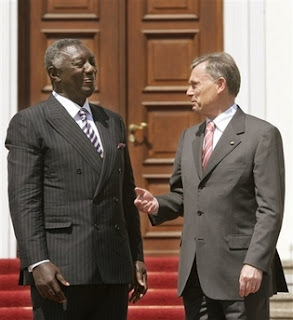 During the visit President Kufuor would sign a partnership agreement between the German state of North Rhine-Westphalia and the Republic of Ghana in Bonn. "These demonstrate the quality of the Ghanaian-German relations and I am confident that these relations - characterized by friendship, harmony and confidence - will be maintained and even deepened in the years to come."